The carved seal, at just 1.4 inches, is a remarkable achievement. "In spring 2016, a team of archeologists from the University of Cincinnati was digging at a Mycenaean site in the Pylos region of Greece when they made a surprising discovery: the intact tomb of a Bronze Age warrior dating to about 1500 B.C. The Greek Ministry of Culture and Sports declared the find the 'most important to have been discovered in 65 years.' 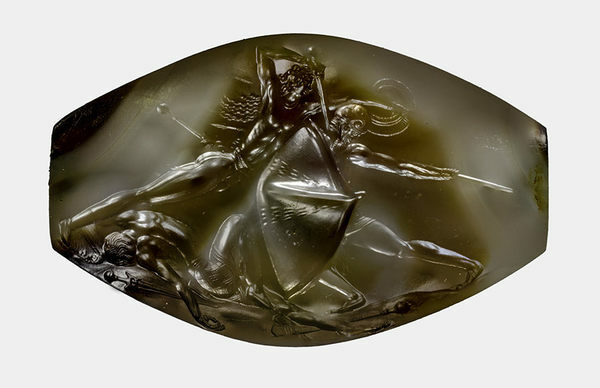 Now, almost two years later, the tomb has revealed its most valuable secret, and intricately carved sealstone that researchers are calling 'one of the finest works of prehistoric Greek art ever discovered.' It didn’t look so at first, but once a thick crust of limestone was cleared off it revealed a detailed scene of a victorious warrior, one defeated opponent beneath his feet and another falling at the tip of his sword. And all this was carved in meticulous detail on a piece of stone just over 1.4 inches long. ..."